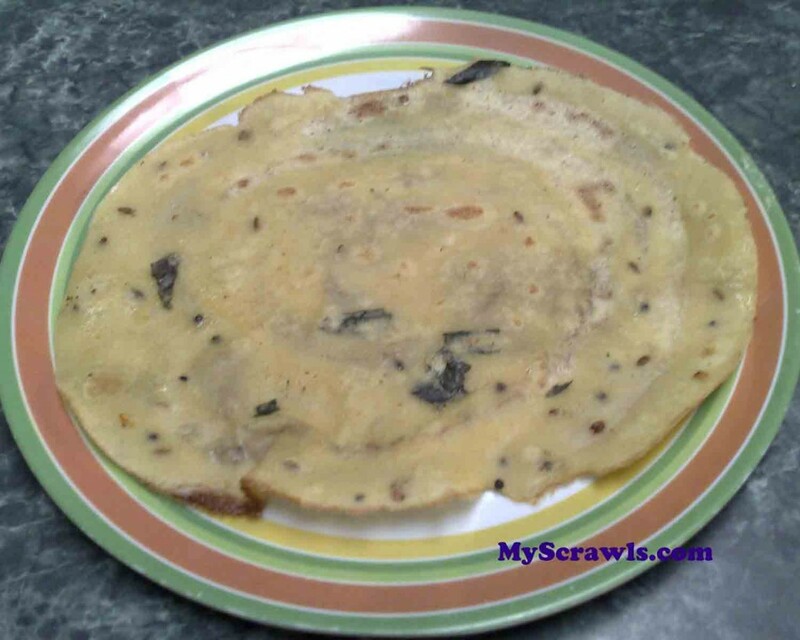 Wheat Dosa | Godumai dosa is one of the jiffy cooking recipes. I call this recipe as rava dosa’s sister (lol). Yup both rava dosa and wheat dosa does not require time for fermentation. Here is the wheat dosa recipe. Mix the wheat flour, salt and water. Make a thin batter without any lumps. Heat the oil and do seasoning with mustard, cumin seeds, red chilies and curry leaves and add it to the batter. Allow the batter to settle for few mins and then start making dosas. You can add 2 tbsps of rice flour to the batter. This will increase the crispness of the wheat dosas. I have added red chilies; the dosa tastes yummy even with green chilies. This recipe doesn’t require any side dish. Depending on the taste you can serve hot wheat dosas with chutney or sambar. Looks really delicious.. nice entry..
Lovely! Never tried making dosa with just wheat flour, Just because i thought they will never come good without adding rava and rice flour.. But, yours came out perfect and delicious! Looks inviting! this sounds great. I’ll try it out and let you know how it went! Nice recipe Anu! Wheat dosa looks crispy n yummy. I like your recipe da, will try n see! U have a nice blog girl!